How does the Asian economic boom affect Australian insolvencies? There is no doubt that the global economy is going through enormous structural change as the weight of global economic activity increasingly shifts towards Asia. 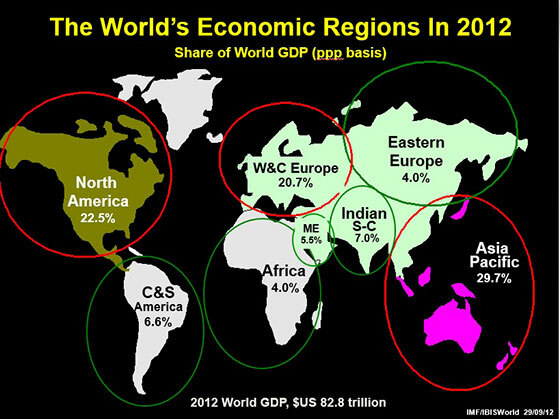 The above diagram demonstrates that in 2012 the Asia-Pacific region together with the Indian subcontinent accounts for in excess of 36% of world GDP. Australia has benefited greatly from this structural change. Three quarters of Australia’s exports are to Asia. We have a similar dependence on Asia with respect to tourism and immigration. Australia has just emerged from the largest resources boom in its history and this is largely as a result of the economic development of mainland China. Moreover the structural change seems to be permanent which means that Australia is in an excellent position for the foreseeable future. In June 2013, Jones Partners commenced a major research project into the state of the Australian economy, businesses at risk and insolvencies. At a function announcing the launch of this project, Mr Phil Ruthven, Chairman of Ibis World spoke in glowing terms about the opportunities afforded to Australia by the Asian economic boom. See the video excerpt taken from the presentation to see what Phil had to say on the subject. However there are risks that cannot be ignored. There is currently a rebalancing taking place as the mining investment phase draws to an end and it is unclear as to whether the domestic economy will pick up quickly enough to counter this investment turn down. The Jones Partners research project has culminated in a report entitled “Collapse Restructure and Renewal-The State of the Australian Insolvency Market” which will be released at a function to be held at The Institute of Chartered Accountants on 29 July 2014. The author of the report, economist Mr Chris Nadarajah will join an eminent panel including Ibis World this chairman Mr Phil Ruthven and the Commonwealth bank’s chief economist Mr Craig James to discuss the report. It is also important to note that this economic boom does not make Australian businesses immune from failure. The increased pace of the Australian economy as a result of this boom clearly leads to many more opportunities and perhaps greater entrepreneurship (which means risk-taking) and on its own this could increase rather than decrease the number of insolvencies. This is because it has been clearly demonstrated that insolvencies are more dependent on the quality of management than the state of the economy. Of course this does not mean that the state of the economy is not a major contributor to insolvency levels. Our research shows that the level of economic activity has a close correlation with the numbers of insolvencies. The major macroeconomic contributor to insolvency levels is economic structural change which is clearly what is happening in the Australian economy as a result of the boom in Asia. We have already seen most of Australia’s manufacturing go offshore and we are now seeing external pressures on many other industries that would otherwise seem to be immune. Accountancy services for example are now being increasingly outsourced to places like India. Overall Australia will clearly reap immense benefits from the growth in Asia however there are both downside an upside risks. The changes taking place in the Australian economy will clearly have an adverse effect on some industries and this will have a consequential increase in the number of insolvencies in those areas. Is Management the key driver of business success or failure?